On Friday, April 26th, at about 7 am, MPD officers responded to the 2800 block of Castro St. for a report of a burglary in progress. The victim called 911 stating she confronted an adult male subject who entered her house through a window. The subject fled the area on foot prior to the arrival of responding officers taking the victims purse and a large sum of money with him. A short time later, MPD Officers contacted a male subject, PATEL, PARESH (48 yrs old, Stockton) in the area of Estudillo St. and Shell Ave. PATEL was found to be in the possession of approximately $600 stolen during the burglary, as well as the victim’s identification and credit cards. The victim was transported to the scene and positively identified PATEL as the man who broke into the residence. 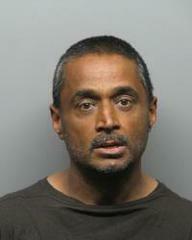 PATEL was arrested and later booked into the Martinez Detention Facility (MDF) for burglary.